COOLER MASTER Silencio FP 120 PWM Fan Performance Edition (R4-SFNL-24PK-R1) Quiet The Beast! The CoolerMaster TPC 812 CPU cooler has what they call a Vertical Vapor Chamber. Will this new tech keep overclocked CPU's cooler? Let's find out. Swiftech’s new H20-320 Edge kit includes the best of their lineup with the Apogee XT Edge waterblock. Let’s see how it performs. The Gelid ICY VISION cooler can fit many different video cards, but what can it do when used on two of the hottest running cards in the same system? Is a quiet fan strong enough to keep a CPU cool? Noctua believes that with its unique features this one is, so we will endeavor to find out if that belief is justified. 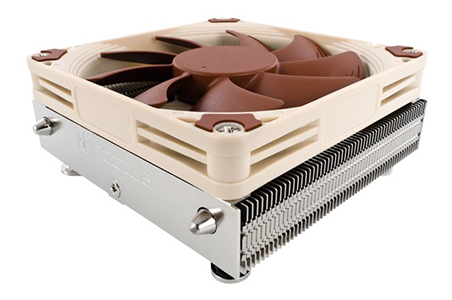 Today we look at one of SilenX newest offerings in the 120mm CPU cooler market. This cooler is LGA 2011 compatible so we will put this to the test to see how exactly it will handle it. SilenX says their latest 120mm fan can produce good cooling with virtually no noise. We say they are going to have to prove it and head into the labs to find out if it can meet this claim. NZXT ‘s new Havik 140 looks like it could rival some of the best in the cooler market. Let’s see how it performs. Can a small heatsink/fan give adequate cooling while reducing system noise? SilenX thinks so. We look at the SilenX EFZ-92HA3 to see if it can cool an overclocked system and stay quiet while doing so.